After the eventful day yesterday, today was the calm after the storm. The only real concern was discovering which pieces of equipment had time to consider their soaking in the truck to Mannheim and decided not to work after all. My mixing desk was one such item. It had clearly taken on board a lot of water and at today’s line check was putting out a lot of digital “help me” noises. The spare was deployed once again whilst Laurence took the broken one to the temporary MASH unit. Also, since Jim’s keyboard riser bore the brunt of the soaking, his B3 had a few issues but Laurence got inside it after soundcheck and apparently all was well for the show. The only other thing in keyboard land that we discovered after the show was that since Jim uses a cloth seat, when he sat in his seat onstage last night, he realised he would have to do the show with a wet bum. The only negative was that the Accordion continued to function. 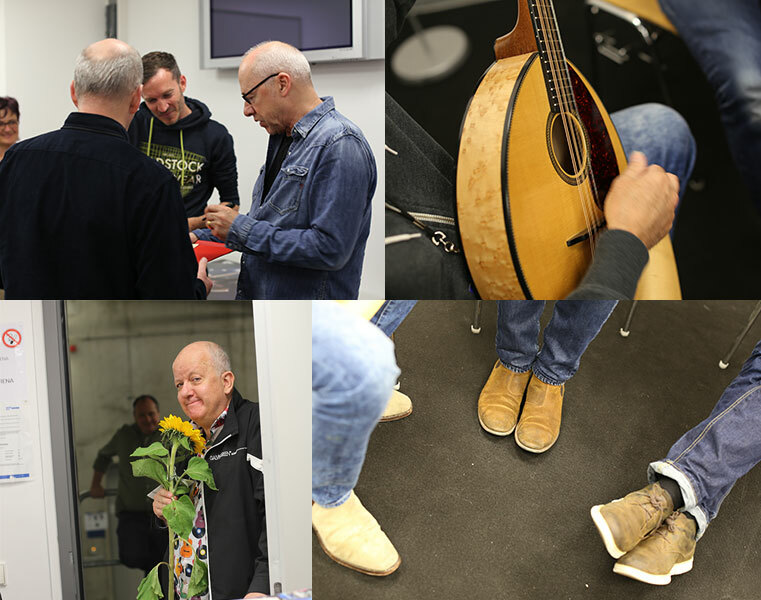 A meet and greet scene…. Clearly a hub for innovation, Mannheim saw Karl Benz build and drive the world’s first motorcar in 1885 and Julius Hatry assemble the world’s first purpose-built rocket plane, the Opel RAK.1 in 1923. A regular competitor in annual gliding competitions, Herr Hatry’s creation must have caused quite a sensation, especially when it blew up on its second test flight. A brief mention of our current hotel, the final stay for this leg of the tour, the wonderful Villa Kennedy, Frankfurt. The hotel is one of our all-time favourites and despite serving up the best Bircher Muesli of the tour, it could be at the top of a downhill slide. Certainly if the internet speed is anything to go by. Unusable, with download speeds of 0.01Mbs, 3G is faster and I resorted to setting up a personal hotspot with my cellphone. My ‘point’ is that slow internet used to be a nuisance but these days it’s positively devastating, our reliance on a high-speed service it is all too clear. Discuss. Speaking of internet, I’m not aware of the full story here….. 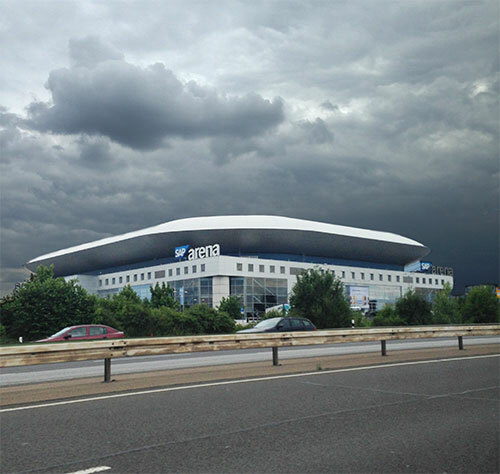 The SAP arena, clearly named after the fluid transported in xylem cells of plants is a high tech predominantly handball and hockey venue. A firm favourite on the German touring calendar although not with the caterers as the kitchens are quite a walk from the dining area backstage, far enough to force Steve to use cling film to cover the dishes as he carried the orders to hungry band/crew members. As for tonight’s show, nothing more to report other than a fabulous German (and some French) audience who were on their feet and at the front of the stage at the usual, unmentionable designated time and would happily have endured unlimited encores had we chosen to do so. As for the band, well it was business as usual, into the Volkswagens and back to the hotel where the bar awaited with a bonus offering of a painful and mostly too loud cabaret act. Don’t get me wrong, I get why bars deploy such musical mediocrity but for us it’s akin to throwing a snake in a cage full of mice. As the standards poured painfully forth, we found a table in the restaurant as far away from ‘ground zero’ as possible.